The Swan SF2 is a big pen by any standards. It’s 14.3cm capped and a magnificent 17.7cm posted! Being black hard rubber it isn’t heavy, but the addition of a very broad 18ct cap band and an accommodation clip overbalance this old fellow slightly. As you can see, there’s no difficulty about dating this one. 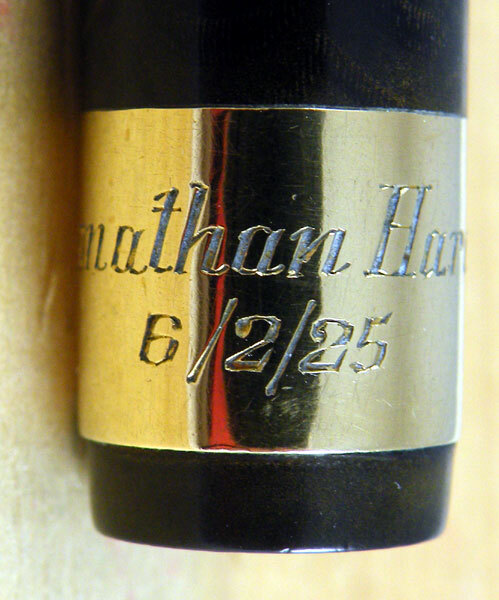 That’s only one of the reasons why I enjoy personalisations, especially when they’re as well engraved as this one. Sad to say I don’t know who Jonathan Hardy was. There’s the New Zealander actor, but I don’t think he’s old enough. As you can also see, this one’s Mabie Todd through and through, with the patented Swan Clip attached. You might notice that once upon a time the clip was gold plated but there’s very little left. I think we can forgive them that, as the one bit of plating on the pen, the lever, is in good order. Fantastic looking pen, and I love the personalization, too. I hope this won’t sound obnoxious, because it certainly isn’t meant to be. Does your blogging platform have a search tool that you can install? I’m trying to find information on a particular model of Mabie Todd, and this seems like a likely place to look. While I enjoy browsing through your entries looking for mention of the pen in question, as you continue to add articles that will become a bit more difficult. I love your blog, and a search function would make it an even more valuable resource, if it’s something you can easily implement. Thanks! I had a look into the possibility of implementing a search feature but I can’t see how it could be done. However, there is the “categories” list on the right. I haven’t done much more than the basics with that. It could be refined to the point where it would make searching for an individual post easier. Also, I expect that if you were creative in your use of search terms, you could make Google search this blog quite thoroughly. Thanks. You’re probably right about a focused Google search. I’ll give it a try, just to see if I can make it work, though for the moment I think I’ve looked at everything you’ve got here on Swans. You’ve actually pulled me off the trail of one pen and sent me after another. Thanks for a consistently interesting blog. Thank you for your kind words, Matt. There will be more Swans to come… There will always be more Swans!